Red Cloud, Chief of the Oglala Lakota Sioux, masterminded the most successful war against the United States fought by an Indian nation. A series of forts established along the Bozeman trail became the focus of Red Cloud’s attacks. Fort Phil Kearny suffered the brunt of these assaults. The U.S. Army did not have the resources to protect both the first Transcontinental Railroad and the Bozeman Trail. The railway took priority and peace through negotiation was sought with Red Cloud. However, the Oglala chief would not attend any treaty talks until the Army withdrew its forces from the contested Powder River Country in Northeastern Wyoming and Southern Montana. After the army abandoned their posts, Red Cloud’s warriors destroyed the established forts and out-buildings to reclaim and restore their land as it was before the incursion of the white man. Red Cloud gave the honor of destroying Fort Kearny to Little Wolf, Chief of the Cheyenne, shortly after the army’s departure. The smoke from the fires could be seen by the retreating U.S. Army personnel as they fled the area. 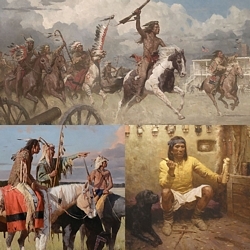 Fine Art Canvases such "Cheyenne Burning Fort Phil Kearny, 1868" are must-haves for collectors of significant works of Western art. This art showcases Liang’s power and strength of composition and his master’s brushwork combined with an extraordinary storyteller’s passion for the untold experiences of Native Americans.